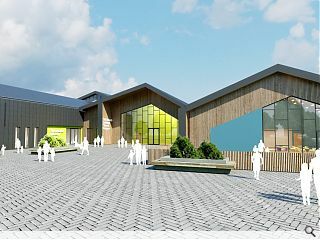 North Lanarkshire Council are to progress a £17.9m shared campus at South Biggar Road, Airdrie, designed by Halliday Fraser Munro and delivered by Morgan Sindall. St Edwards and Tollbrae Primaries shared campus will unite both schools, which currently operate from separate buildings adjacent to the new campus, within a single structure. Built on the site of existing playing fields the 5,200sq/m campus takes the form of twin classroom wings conjoined by a shared gym, dining hall and multi-purpose spaces. When fully operational the combined school will have a capacity for 559 pupils and 85 nursery places. Shed 7 design vibe -- tick. Trying out some new fangled PLM even if we can't spell it -- tick. White collar gravy train -- tick. "fully coordinated 3D model" -- hopefully the architects fees are reduced accordingly.